Do you have a single or multi-stage centrifugal blower? The way to tell is whether your application requires uniform airflow (single) or varying airflow (multi-stage). What type of blade orientation do you have – forward curved, backward curved, airfoil, or radial? Do you have a low pressure, medium pressure or high-pressure centrifugal blower? Do you have a pressure blower or volume blower? Is your centrifugal blower used for ventilation, combustion, aeration, particulate transport, drying, exhaust, air-purification or cooling? Are you experiencing reduced performance or complete shutdown? It is not always necessary to have all the answers to these questions, but the more you can relay to your centrifugal blower repair professional, the better prepared they can be when they arrive at your business. They might also discuss the symptoms you are experiencing and give you a few things you can check out on your own. Here at Pat’s Pump & Blower, we offer blower sales and repair for all types of blowers, including providing reliable centrifugal blower repair. 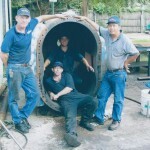 We pride ourselves on correctly diagnosing and repairing blowers to have you back in production promptly. Contact us today with any questions you may have.